The most renowned Serbian violinist Stefan Milenkovic was the special guest at the concert of the Lake Forest Symphony, held on 10th and 11th of September 2016. Under the baton of American-Serbian conductor Vladimir Kulenovic, symphony performed the works of Beethoven. "Adagio for Strings" by Samuel Barber was performed as the opening number in memory of the victims of the September 11th terrorist attacks. Both concerts were performed before a packed concert hall primarily with American audience as well as with a large number from the Serbian community, who greeted music director Vladimir Kulenovic and special guest Stefan Milenkovic with standing ovation. 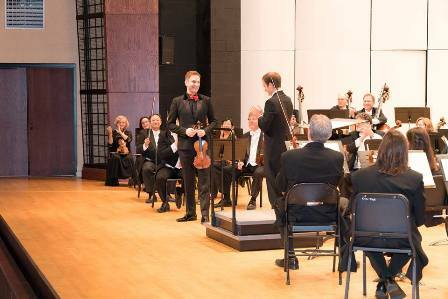 At the invitation of the Consulate General, and thanks to the cooperation with the Lake Forest Symphony, the concert was attended by members of the Consular Corps in Chicago. They were warmly welcomed to the concert by the music director Vladimir Kulenovic and CEO Susan Lape. Acting Consul General Dejan Radulovic met with the performers and representatives of the Lake Forest Symphony and extended warm wishes for a successful 59th music season. A reception was held after the concert which was co-sponsored by the Consulate General.